A new brand has cropped up on my radar recently, and every product that I try, I fall in love with. No exception. I was recently treated to a heavenly facial by Anne Semonin at Liberty, which was specifically tailored to my skin concerns. Afterwards, I was recommended a few key products from the range. The way my skin has adapted to these products proves that an expert eye can make all the difference to your skincare routine; the Anne Semonin Comfort Cream, and also the Tissue Serum have now become staples in my beauty regime. The extreme comfort cream (round pot in the top image) was recommended to me by the therapist due to the amount of long haul flights that I go on, which cause havoc on my skin. 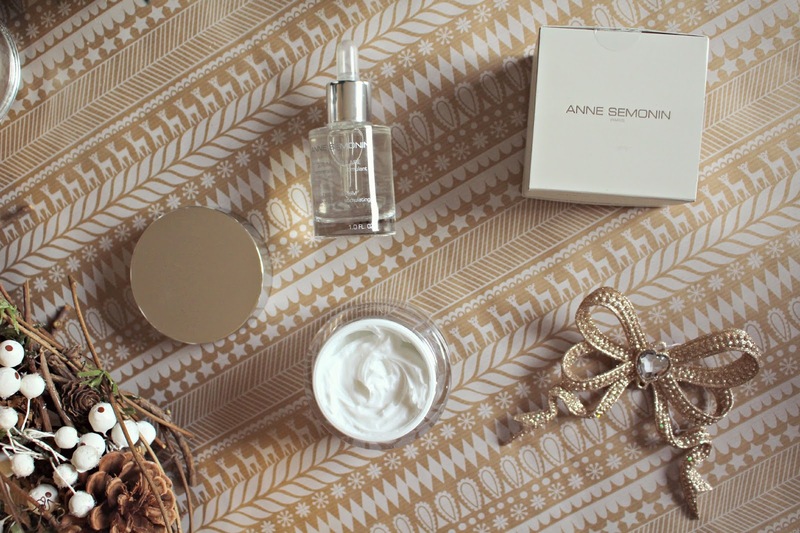 The Anne Semonin Comfort Cream is a rich, protective skin which immediately comforts dry skin. I apply a thick layer after removing my makeup on the plane and it combats any dryness, but also gives a smoothing and nourishing sensation. What makes this cream different to other intensely moisturising creams is that the Beeswax ingredient within it creates a protective barrier on the skin, so the effects of flying are minimised. Skin is healed with Macadamia oil, as well as Soya, and Sunflower seed oils which comfort and repair the skin, while Seaweed Extract encourages cell regeneration. For once, my skin looks better after the flight than it did before take off! It’s a chunky 50ml jar, so I usually pop some in a Muji pot to put in my flight bag. The pot retails for £68 and you can buy from Liberty. 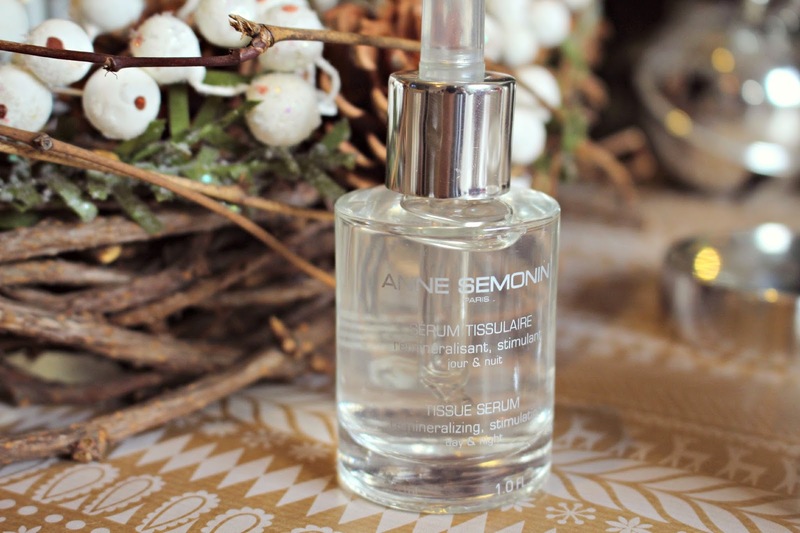 The product in the image above is Anne Semonin’s Tissue Serum. This serum should come with a warning because it’s so good you’ll fall in love with it, but it comes at a price. A big price. It’s £96 for 30ml… (from Liberty) I know, it’s crazy expensive. If you have a big huge budget for your skincare routine then I wouldn’t think twice about buying this, but for us mere mortals I have to be honest and say, stick to the cheaper versions. It’s a serum designed to stimulate the more delicate areas, such as the eye, lip and throat areas. I find it very smooth and soothing to use and particularly love to use it around the eye area. It is the fastest absorbing serum I’ve ever used, and I’m pretty sure that means my skin loves to drink it all up. The formula is supposed to reduce the appearance of fine lines, so I’m hoping that by using it regularly it might stop the scary appearance of lines around my eyes recently!! The fragrance is of very delicate rosewater, which is also incredibly relaxing to inhale; I often add a few drops to my hands, and inhale before lightly patting on my face. If you’ve got the budget for this kind of skincare, then you should definitely visit the Anne Semonin beauty counter in Liberty and give the serum a try. I’m yet to find a good dupe for this, but if I do, i’ll update this post and let you know! Have you discovered Anne Semonin yet?